The funeral for former first lady Barbara Bush brought together nearly every present and former resident of the White House to Houston in a day of mourning. Each surviving former president and first lady sans Donald Trump and Jimmy and Rosalynn Carter was in attendance. A group photo of all the former heads of state went viral over the weekend, but it was not the only image from the funeral that captured the internet’s attention. A grainy, low-quality photo of Barack Obama and Melania Trump sitting together prompted some humor on social media at the expense of the current commander-in-chief. Melania was spotted smiling and sharing a laugh with Obama, which sent the social media community into a joking mood. Commentators have often noted that Melania occasionally appears to be in a dour mood when she is around her husband, fueling speculation about potential tension in their marriage. Several tweets with humorous captions accompanying the photo accumulated tens of thousands of likes and retweets. One poked fun at the fact that Obama is one of only five people Melania follows on the official @FLOTUS Twitter account. 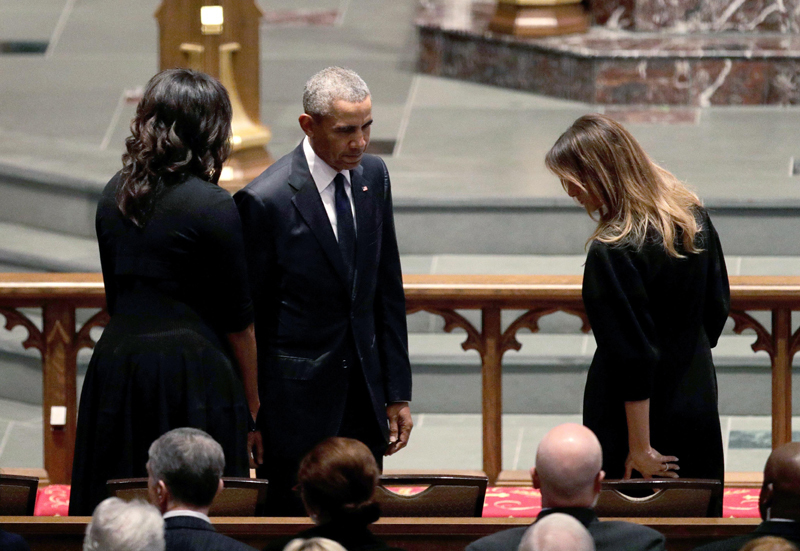 On the other hand, many commended Obama for seemingly being graceful around Melania, given some of the things her husband has said about Obama over the years. Donald Trump famously pushed “birther” conspiracy theories about Obama’s nationality during the previous administration. President Trump reportedly spent the weekend golfing in Florida. Jimmy Carter could not attend due to prior commitments abroad and with his wife Rosalynn recovering from a recent surgery.